If you want to protect your valuable data from unauthorised access you normally use some technique like password protection or by key protection etc. Encryption is the process of protecting data with key or password from unauthorised access so that if data is stolen or hacked then also it is safe and secure. Today we will see how we can protect our valuable data and database with Transparent Data Encryption (TDE) feature available with SQL Server database. As a database administrator you take database backups regularly and keep the backup copies on storage drive or tape but if those files are stolen or somebody tries to misuse data by restoring it then how will you protect it from cracking or decrypting, to handle such situation we use Transparent Data Encryption before our data is misused. Basically in Transparent Data Encryption (TDE), it uses Database Encryption Key (DEK) which is secured by a certificate and kept in master database. Database Encryption Key is either protected by certificate or an asymmetric key secured by Extensible Key Management (EKM) handler with the help of Microsoft Cryptographic API (MSCAPI). In TDE data is encrypted using Advanced Encryption Standard (AES) and Triple Data Encryption Standard (3DES) encryption algorithms. 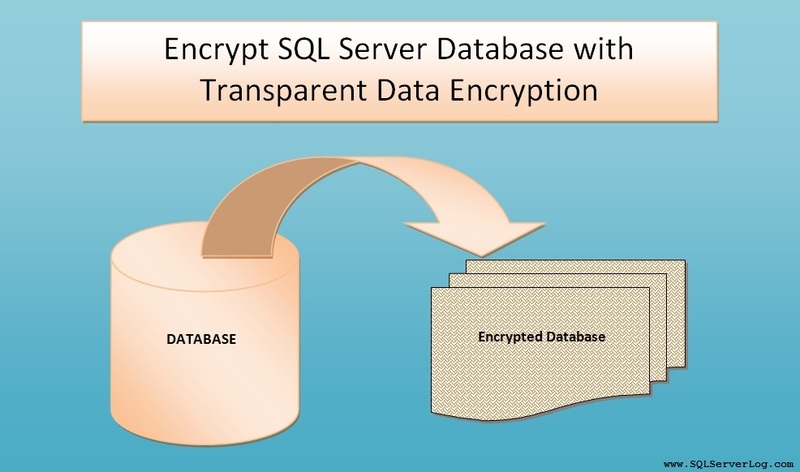 Transparent Data Encryption technique is used at data page level, database encrypts it before writing and it is decrypted at the time of reading. Hence you can observe I/O encryption and decryption of data file and log file, also you may face performance degrade because if you are using any database encryption on database instance with TDE then tempdb database will be encrypted automatically. When you backup a database without encryption, you will be able to read it’s table content row by row and our main motto is to encrypt those readable contents inside backup and log files. Now we will see step by step process of Transparent Data Encryption. We have ‘ClientInfo’ database in SQL Server 2012 Enterprise Edition for demonstration purpose. First of all we have to create a Master Key with some strong password in database as shown below. We have to create a certificate with certificate name, here we have ‘ClientInfo_Cert’ as certificate. We need to create database encryption key (DEK) with AES_128 algorithm with respective certificate. --Create Encryption Key, Encrypted by Server Certificate. Once you will execute above query, you will get warning message as given below which is specifying to keep a backup of certificate and private key which we have created. The certificate used for encrypting the database encryption key has not been backed up. You should immediately back up the certificate and the private key associated with the certificate. you must have backups of both the certificate and the private key or you will not be able to open the database. So, It is very important to have a backup of Certificate and Private Key otherwise you won’t be able to restore your database. As per warning given, we will first take backup by below query and will keep both certificate and key at safe place to use in future. Now we will enable encryption on the database ‘ClientInfo’. You can verify certificate details and encryption key details with sys.certificates and sys.dm_database_encryption_keys as given below. Take full backup of ‘ClientInfo’ database. This database backup will be in encrypted format and secured. --Full Database Backup with Recovery. Try to restore this database backup file on other instance (MANZOOR\SQL2) and observe the message. You will get error message indicating to provide server certificate because our database backup is encrypted with TDE and to decrypt it you need server certificate and key. Cannot find server certificate with thumbprint '0x8295323BE77B6C77D0C93D17A0DFE3ECC5B827D2'. To restore database on other instance we have to create master key with new password and new certificate with decryption by original password and after that we will again try to restore database. Kindly refer below. --Create new certificate with reference to earlier private key and decrypt it by same password. Now try to restore ‘ClientInfo’ database on other instance (MANZOOR\SQL2) and you will be able to restore database successfully as shown below. Excellent article and illustrated the TDE in very simple manner. Thank you. I watched your TDE tutorial video. Simply, it is awesome. I am really impressed. I’ll keep in touch with your for future help. Thank You Mohammod. I will keep posting more articles and videos if time permits. Thank you so much for your great help and to the point explanation. Hats off for you and god bless you and your family. Please keep upload this kind of videos. What will happen if some one stolen our certificate and .pvk along with encrypted backup file.